Microsoft is trying something new and we’re not very confident it’s for your benefit. As of February 2016 Windows 10 will automatically download for millions of users. In July 2015 millions of people awoke to Microsoft’s ‘new approach’ to sales and software integration of their new operating system Windows 10. Like a spy in the night, suddenly there was the intrusive and annoying pop up in the start bar – urging you to upgrade your system…for free. Everyone likes something for free right? But as is usually the case, the capitalisation of this mentality was not for the benefit of the consumer. Aside from the bugs with the software and the potential problems an upgrade could cause, the biggest problem is the way that Microsoft chose to engage with its customers, and chose to leverage their naivety in order to get what they want. If you wave a shiny banner in front of a user saying ‘upgrade me for free’ and there isn’t anyone around who knows better to tell them “don’t do it, they haven’t tested it properly” then they may chose the exciting & nonsensible option, not knowing how it will affect their system and their applications. I say may – but ‘they’ definitely do. There’s no denying it; Microsoft offering the software as a free upgrade for any Win 7, 8 and 8.1 users was curious. It is said that this technique was implemented avoid any more damage to the company’s reputation following the disappointment of Windows 8.Or maybe this ‘free’ roll out was a type of bug testing at the expense of the user. All that is clear at this point in time is that Microsoft very desperately wants all Windows users to be on Windows 10 in the very near future and they are using very aggressive tactics in order to get themselves there. 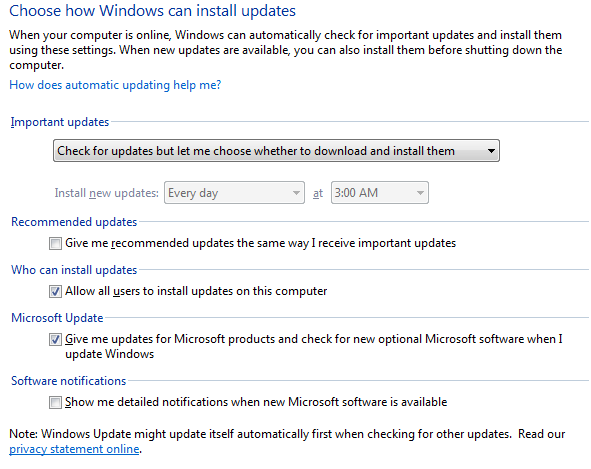 In Windows Update settings on your computer, there are two different types of update labelled by their importance as deemed by Microsoft; optional, recommended and important. There are also settings (which by the way are the default for a new system) where ‘recommended’ updates are installed automatically along with important updates. Originally, the Windows 10 Free upgrade for users of Windows 7, 8 or 8.1 was listed as ‘optional’ in user settings. If you could avoid clicking on the ‘upgrade me’ pop up button then you were relatively free to choose your own operating system. “This move targets users who don’t know enough to disable recommended updates, but have also rejected Microsoft’s previous offers.” This could create a nasty snarl of blowback if the upgrade push starts making life difficult for large numbers of people.” Joel Hruska Extreme Tech February 2nd 2016. If you know enough about computers then you would have changed your Windows Update settings on your computer to prevent this automatic download, (We’ve demonstrated how to do this below)but let’s face it – there are millions of people out there who don’t know as much as you. The list of problems and complications with the software upgrade grows literally every day. We know this, because we are supporting these people. Despite the influx of work we are seeing as a result of this – we really don’t enjoy experiencing the frustration of our clients at the sometimes lengthy process involved in fixing these complications after expressing only borderline permissions for a Windows 10 upgrade. How is Microsoft getting away with these tactics in this day and age where the consumer is key? Their use of language is deliberately vague and misleading, and their methods are coercive. They are pushing people to install their product regardless of compatibility and any possible pitfalls associated with the upgrade. Next thing you know all other Windows Operating systems will become obsolete and we will no longer have choice at all. Well….there is always Mac….. If someone engages in an activity with full understanding of the possible risks associated with it, this is called choice and it’s a part of life that we accept when sometimes our choices are don’t turn out the best . What is unacceptable is when choice is blurred by smoke screens and mirrors and becomes more like wavering, unsure and bullied consent. I’m not sure what Microsoft plans in the future, but I hope they receive enough back lash about the way they are treating their customers, that possibly they will re-think their approach to things next time around. As it stands, I am not feeling very optimistic. If you do currently have Windows 7 or Windows 8, our advice is for you to stick with this until all of the bugs associated with the Windows 10 transition have been ironed out. Windows 7/8 are still great operating systems and we recommend sticking with what you know. If you do want to opt in and install Windows 10 we highly recommend you contact an IT professional before you get started. If you are still being annoyed by the Windows 10 upgrade popup adds on the bottom of your monitor there is a small patch we can install for you to make this go away. It’s a little bit tricky though and can cause problems if you don’t perform the patch correctly, so we don’t recommend our clients do this themselves. You can contact us to discuss this and we can perform a quick remote access connection with you and have this removed in under 30mins. More on Remote Support here. Contact us here at Computer Zen for any of your Window’s 10 questions or woes. Newsreader: Some Queensland businesses are being forced to pay ransoms to cyber criminals who break into their computer systems. The hackers use what’s known as Ransomware to lock users out of their own systems. Jonathan Lee has been investigating how it works. Jonathan Lea: As our lives move online, we are becoming susceptible to attacks we once never thought possible. According to cyber crime expert, (Prof) Bill Caelli, the latest and most threatening is called Ransomware. Bill Caelli: The attacker will get into your computer, will scramble the data in your computer and then demand money to unscramble it for you. Jonathan Lea: The password can cost as little as $200. Each day you don’t pay, the price goes up. For a business locked out of its computer system, it’s potentially catastrophic. Bill Caelli: The sheer technology competence of the attackers in the last two years has massively increased. Jonathan Lea: Australia is the world’s fifth most targeted nation. Computer technician, Toby Hazlett, deals with at least one infected client a week. Toby Hazlett: Some of the ones I’ve seen even take a photo of you through the laptop’s web camera and puts that into the image on the screen so they’ve got a picture of you, so know they know where you live. Jonathan Lea: Most never contact Police paying the ransom through Bitcoins, an untraceable currency. Unfortunately for users, the odds are firmly in the favour of the hacker. Being infected can be as simple as clicking on a dodgy link, downloading, or even visiting a malicious website, all without any knowledge the damage has been done. The threat can be averted but only if you take precautions. Toby Hazlett: Backup your software on a number of devices. Jonathan Lea: If you think this is scary, consider the future. Toby Hazlett: Your new cars that are now connected online, maybe they can get hacked. Jonathan Lea: It gives a whole new meaning to traffic safety. Jonathan Lea, Ten Eyewitness News.